It didn’t take long after the death of her dog Starr before Lisa Procaccini began browsing on Petfinder. She was just thinking about what she wanted in a pup, she told herself, and planned to wait at least six months before getting serious about rescuing another dog. But then up popped Teddy. “He was the cutest thing ever!” she says. The only trouble was that she and her boyfriend were living in Trenton, NJ, and Teddy was in Alabama being fostered by Crossing Paths Animal Rescue. Fortunately, the group also had foster families in Yardley, PA, not all that far from Trenton. Read Teddy’s story in Lisa’s words. 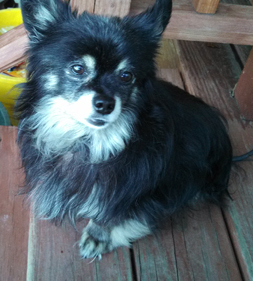 Lisa contacted a foster mom in Pennsylvania and learned that Teddy was already spoken for, but by this time she was ready to adopt, and Baxter, a Schipperke mix, found his forever home with her and her boyfriend. About three months later, she got a call from the animal rescue. Teddy, as it turned out, was available again and was being transported to Pennsylvania. Lisa didn’t know how her “grumpy old man, Baxter,” would take to another dog, so she took him with her to meet Teddy. A veterinary check-up showed that he was healthy, and he certainly was — and is — happy. He even does a little dance to show it. “We have taken our boys camping, kayaking and even bike riding,” she says. “They love the outdoors as much as we do.” The couple has moved from Trenton and “the boys” have a big yard to play in. It couldn’t get much better than that. For Teddy, stars fell on Alabama the night Lisa logged onto Petfinder.